This part tells how all the ingredients gradually came together for television to become a reality. The discovery of cathode rays, wireless propagation, the gadgetry and people who made it all happen. 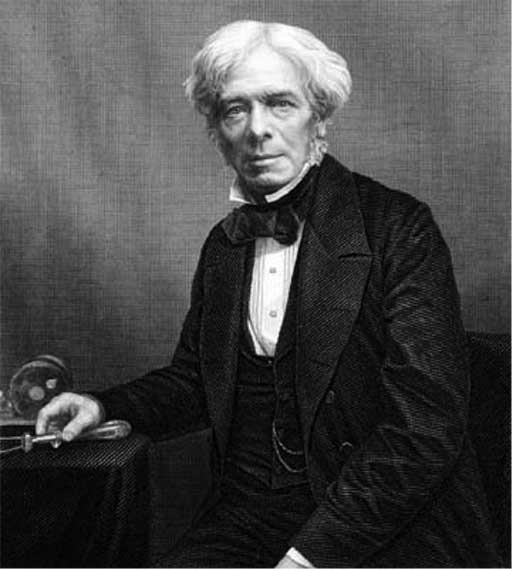 In 1838, the English scientist Michael Faraday (1791–1867) discovered cathode rays. His main discoveries include those of electromagnetic induction, diamagnetism and electrolysis. Diamagnetism ventures into quantum mechanical effects that explain levitation and other oddities. He also laid the foundations for electricity generation and electric motors and popularised terminology such as anode, cathode, electrode, and ion. 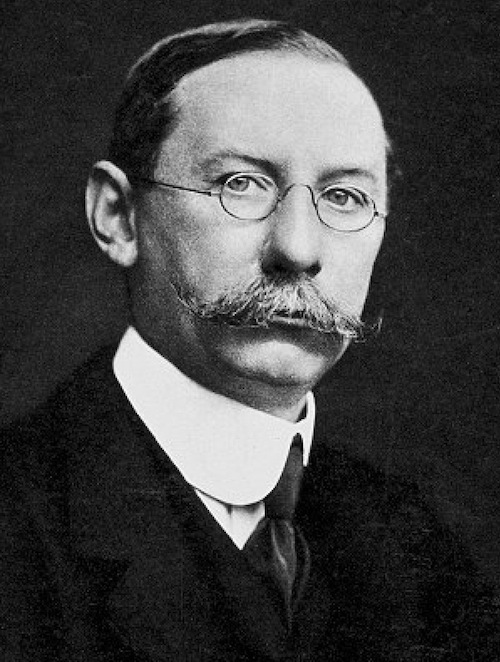 The experimentation of cathode rays is largely accredited to Sir Joseph John Thomson (1856–1940), a British physicist who was awarded the 1906 Nobel Prize in Physics for the discovery of the electron and for his work on the conduction of electricity in gases dating back to April and May 1897. Thomson discovered this through his explorations on the properties of cathode rays where he found that the rays of electrons could be deflected by electric and magnetic fields, a fundamental function of the Cathode Ray Tubes used in television sets, before the modern flat screen. 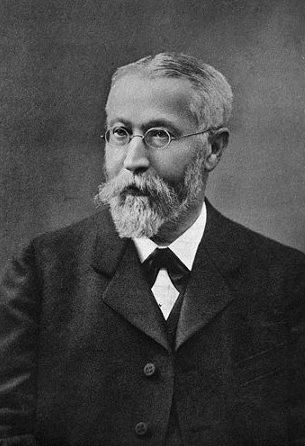 The experiments of the German inventor and physicist Karl Ferdinand Braun (1850–1918) led him to build the first cathode-ray tube (CRT) and cathode ray tube oscilloscope in 1897. 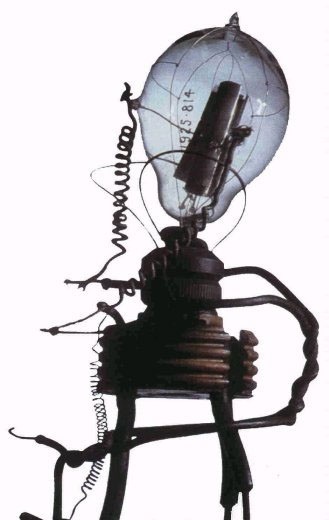 It was a cold-cathode diode, a modification of the Crookes tube (an early experimental electrical discharge tube invented by English physicist William Crookes around 1869-1875, which led to the discovery and use of X-Rays) with a phosphor-coated screen. 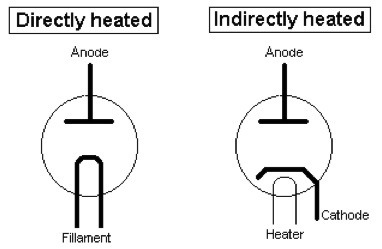 A cold-cathode emits electrons whilst not being heated electrically by a filament. 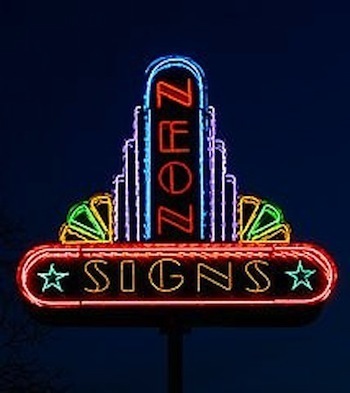 A common cold-cathode application is in neon signs. In 1922, Weiner Weinhart and John Bertrand Johnson (1887–1970) developed the first cathode ray tube to use a hot cathode as a commercial product. In 1898, Braun invented a crystal diode rectifier or cat’s whisker, as used in the simple radio receivers known as crystal sets. Prior to that the first widely used detector was the coherer, invented around 1890 by the French physicist Édouard Branly (1844–1940). To make it more practical, it needed a “decoherer”, developed by British radio pioneer Sir Oliver Joseph Lodge (1851–1940) to maintain the device’s sensitivity after each morse code reception. Guglielmo Marconi used these in his early radio equipment until the availability of the crystal detectors. Braun’s major contributions were the introduction of a closed tuned circuit in the generating part of the transmitter, and its separation from the radiating part (the antenna) by means of inductive coupling, and later on the usage of crystals for receiving purposes. Tuned circuits enable us to separate different radio and TV stations from each other in the receiver, though obviously the transmitter will be locked into its licences carrier frequency on the broadcasting spectrum..
“Had Marconi been more of a scientist and less of a discoverer, he might have concluded that his critics were right, and stopped where he was. But like all the discoverers who have pushed forward the frontiers of human knowledge, he refused to be bound by other men’s reasoning. He went on with his experiments; and he discovered how, by attaching his transmitted waves to the surface of the earth, he could prevent them from traveling in straight lines, and make them slide over the horizon so effectively that in time they joined the continents of the world. 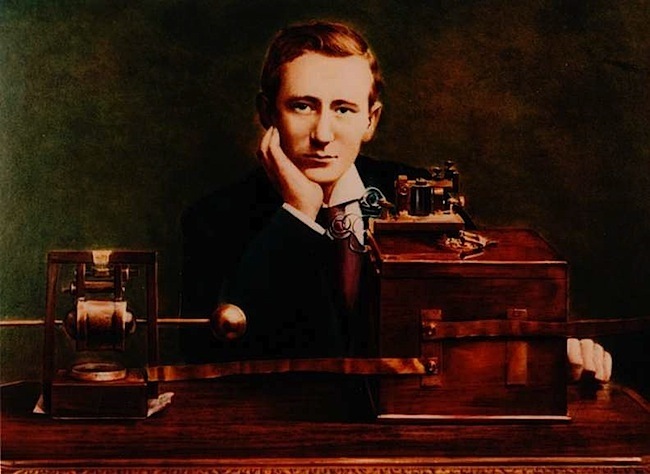 Several years were to pass before agreement was reached on the nature of Marconi’s great discovery, though Marconi himself understood very well how to apply it and to employ it usefully; and it proved to be the foundation upon which the practical art of wireless signalling was built. – Edwin Howard Armstrong, “Wrong Roads and Missed Chances”, 1951, reprinted in “The Legacies of Edwin Howard Armstrong”, page 289. Meanwhile, other building blocks to television were being devised that enabled amplification and later the transmitting of an image. The first images transmitted electrically were sent by early mechanical fax machines, including the Pantelegraph invented in 1881 by the Italian physicist Giovanni Caselli (1815–1891). In 1884, Paul Gottlieb Nipkow, a 23-year-old university student in Germany, patented the first electromechanical television system which employed a scanning disk, a spinning disk with a series of holes spiralling toward the centre, for rasterization. 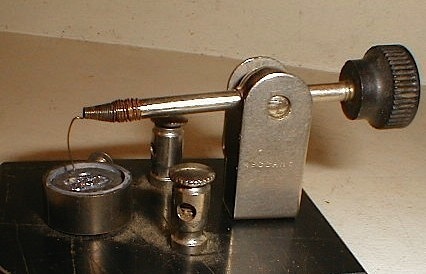 Nipkow’s design would not be practical until advances in amplifier tube technology became available. 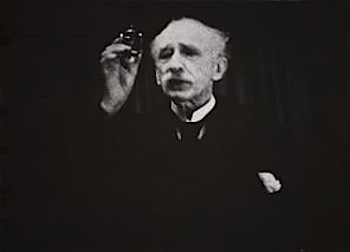 The simplest thermionic valve was invented by the English electrical engineer and physicist John Ambrose Fleming (1849–1945) while working for the Marconi Company in London in 1904 and named the diode, which had two elements and was used as a radio detector and a rectifier. 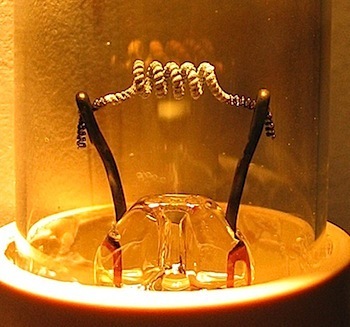 The American inventor Lee De Forest (1873–1961) added a third electrode in 1906, to invent the first electronic amplifying device, the triode. 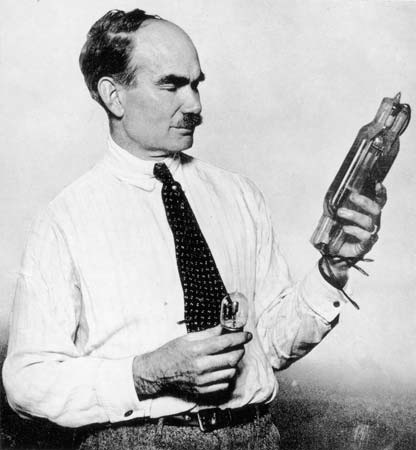 In 1906, the German Professor Max Dieckmann successfully demonstrated using a cathode ray tube (CRT) as a display device, with his experimental results published by the journal Scientific American in 1909. 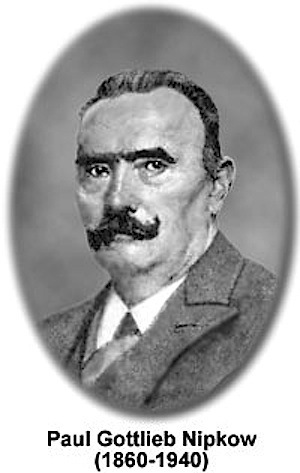 In 1907 Russian scientist Boris Rosing (1869–1933) became the first inventor to use a CRT in the receiver of an experimental television system. He used mirror-drum scanning to transmit simple geometric shapes to the CRT. In a 1908 letter to the journal ‘Nature’, a Scottish consulting electrical engineer Alan Archibald Campbell-Swinton (1863-1930) envision a completely electronic television system. In 1911, Campbell-Swinton expanded on his proposal in his presidential lecture to the Röntgen Society of London. The Times of London reprinted the lecture eight days later. Earlier, Karl Ferdinand Braun had built the first cathode-ray tube (CRT) using a cold cathode in 1897. Campbell-Swinton reasoned that by scanning a CRT electron beam back and forth in rows from top to bottom while varying the intensity of the electron stream, a moving image could be drawn in the same manner as with Nipkow’s disks. Campbell-Swinton also proposed using a variation on the CRT as a camera tube as well. He suggested that this could be achieved by replacing the phosphorus screen of the CRT with some kind of photoelectric material, and that an image would then be focused on it, to produce a varying positive charge on the surface that corresponded with the intensity of light, as it represented the difference shades of the subject. By scanning the photoelectric material with the electron beam in the same way, the charges could be read and the image turned into an electrical signal that would then be sent to the “receiver”. It would take another two decades before inventors such as Kalman Tihanyi, Philo Farnsworth, and Vladimir Zworykin could make it work. 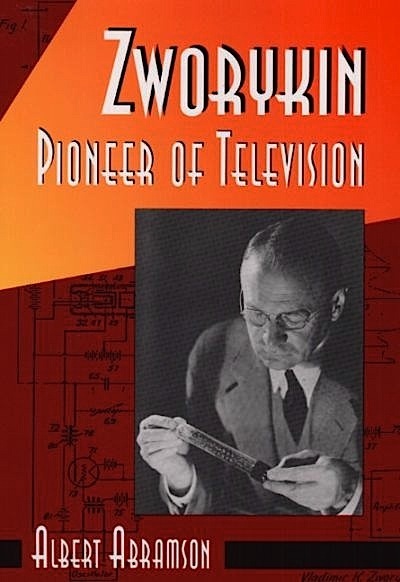 Around the time Boris Rosing was using a cathode ray picture tube, an American inventor and television pioneer, Philo Taylor Farnsworth (1906–1971) was born. 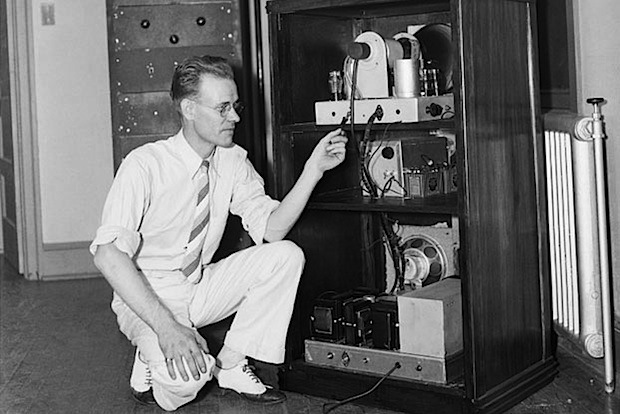 Farnsworth was an avid reader of science magazines and science fiction books, as well as being aware of the early discoveries with electricity. He too conceptualised a television system using electrons to paint an image when he was only fourteen. Farnsworth then built his prototype at age nineteen. He recognised the limitations of the mechanical systems, and that an all-electronic scanning system could produce a superior image for transmission to a receiving device. Meanwhile, a man who would be his competitor, Vladimir Kosmich Zworykin (1888–1982) was studying under Boris Rosing at the St. Petersburg Institute of Technology. During World War I (1914-1918), Zworykin served in the Russian Signal Corps, and tested radio equipment for the Russian division of Marconi, for use by the army. When the Russian Revolution (1917–1918) erupted, Zworykin left for the United States. Part 4 tells how some of the early devices were primitive, being made from bicycle parts, until overtaken by advances in the electronics field. There were many people who contributed to the development of television and it was not always fair in who benefited most from the discoveries. As isolated as Australia was in the very early days, news of these discoveries reached here and the locals began experimenting.